1400 Seat Back System with a seat post to fit the AM-12 and AM-16. 1400 Seat Back System that is a standard feature for the ProSeries 1416 and 1420. This Seat Back System can be used on the ProSeries 1412 with the addition of a seat post designed for the 1412. This versatile seat back uses a double tube support system. The padded back measures 8 inches wide by 10 inches tall and can be adusted by large knobs up/down the double tube. Quick release cam lock levers allow the 2 removable padded lateral supports adjustments up/down, forward/back and swing in/out. A strap secures lateral supports in front of rider. 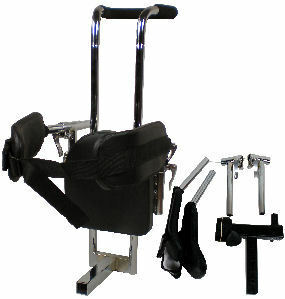 Features built in push grip for caregiver or parent. The 1400 seat back system can be adapted with other accessories to provide more trunk support. This seat back system does not include a seat but can be used in conjunction with a saddle seat, bench seat, and tractor saddle seat.